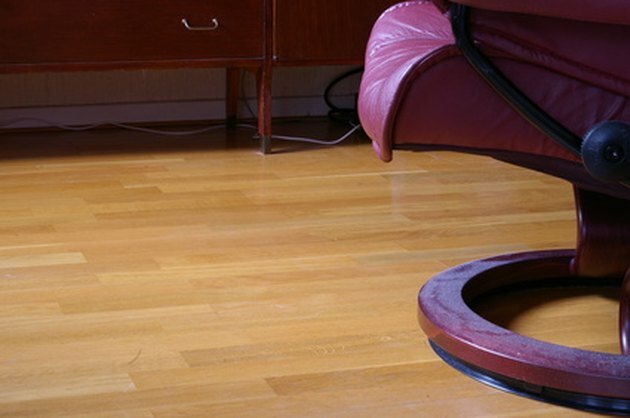 Floating floors such as laminate are designed to be installed with an expansion space around the perimeter of the floor. This space allows the entire floor to "float" from side to side when it expands and contracts due to changes in temperature and humidity levels. It is imperative that the expansion space be maintained not only around the perimeter of the room but also in each location where the floor meets a vertical surface such as a kitchen island. 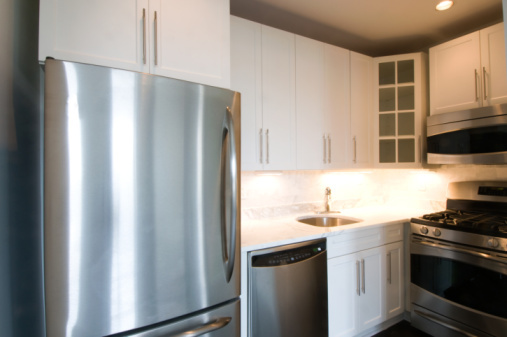 Because of this expansion requirement, many homeowners are left to wonder whether they can put a heavy object such as a refrigerator on a floating floor. Laminate floors are tougher than they look. Laminate flooring was invented by the Pergo Company in the mid 1980s. Designed as a glue-together system of laminated planks, the floating floor method of installation ensured that the flooring would not separate between the planks as the room conditions changed. Although the early floating floors were not recommended for installation in kitchens, bathrooms and other areas where water exposure might be a factor, later innovations, such as the snap-together self-sealing planks, made laminate a popular product for installation in virtually any room. Although laminate manufacturers warn against placing heavy objects on a laminate floor due to the need for expansion movement, a refrigerator does not constrict the floating capabilities of a laminate floor. This is due to the even distribution of the refrigerator's weight over the entire area of the floor on which it rests. While placing a refrigerator on a floating floor is a common practice, it's a good idea to plan ahead. Purchase and install a good-quality set of rollers for the bottom of the refrigerator before placing the unit on your new laminate floor. This will prevent damage to the floor in the event that the refrigerator needs to be moved, as the rollers will distribute the weight of the unit more evenly on the floor surface. Laminate flooring must be installed according to the manufacturer's guidelines in environments where water is a factor. This involves sealing all wall expansion spaces in the refrigerator area, with 100 percent silicone sealant. In addition, if there is a water line running through the floor to the refrigerator, the expansion space around the water line must be sealed with the same silicone compound. Failure to do so will void all manufacturer warranties.